Welcome to All Fired Up Studio! 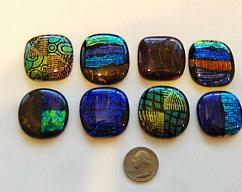 8 dichroic cabochons in variety of awesome blues,green,gold,red and purples: each cab has layers and layers of dichroic glass fused as one with a cap of clear on the surface. The cabs range in size from approximately 32mm x 35mm to 40 mm x 40mm and since everything is handmade they aren't exact they can be a little smaller or a little bigger. The quarter is used for reference of the size for the cabs so you can get an idea of size. All of the cabs have a black or purple iridized base unless otherwise noted and all of the edges are smooth. 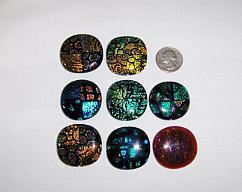 This listing is for 8 handmade, Dichroic Fused Glass Cabochons or tiles that you see in the pictures above. This picture doesn't do its justice!! Quarter is for size determination and the Quarter not included in this listing!! Every piece is designed and handcrafted in my home studio. I have been creating with glass since 1995. A lot of thought goes into each and every piece prior to its birth. First, I hand pick all of the colors, shades & textures to be used. I then cut the pieces to the desired shape and size. Some pieces are then ground down on my glass grinder to smooth out any edges or to simply shape them. I then carefully stack the pieces until I come up with a look that excites me. At this point, the piece is carefully placed into the kiln, careful that each piece stays in place and doesn’t shift. This is where the fun begins, over the next 24 hours, the piece will gradually heat up to 1400 - 1500 degrees. Once the piece has completely cooled down, I remove it for grinding a second time. The piece in then placed back in the kiln for a final fuse- called Fire Polishing, this is what gives it that smooth and polished look. 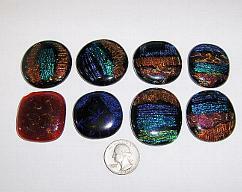 In some cases a cabochon may visit the kiln many times before it is considered complete. Once all this is done then they go back in the kiln to anneal at 960F for 1 hour. I give much attention to annealing (cooling) my pieces properly, this insures that the piece will remain strong and maintain its strength & durability. I love what I do, and I believe it shows in each and every piece I create. They all have nice edges and are cased or capped with crystal clear glass. They can be used for back splashes in bathrooms, kitchens or even the fireplace accents. They can also be used with PMC, with wire wrapping, you can add bails for pendants or blank bails for other jewelry types, it can even be used for door knobs. Your imagination is your own limit to what you can do with these cabochons. They are all flat backed and do not have a hole. This listing is for 8 cabochons range in size from approximately 32mm x 35mm to 40 mm x 40mm r. They are unique because of being handmade, as goes with the sizing they aren't exact, but close to size. 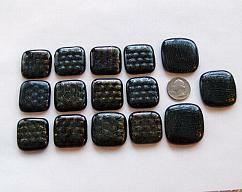 These cabochons are 90 COE. They are unique because of being handmade, as goes with the sizing they aren't exact, but close to size. Dichroic glass pieces are very difficult to photograph because of the reflective properties of the glass. I have done my best to portray them as they really look, but they really are more beautiful in person. Please remember that different monitors display colors differently. These Fused glass decorative tiles will add color and uniqueness to any home in any environment. For all those crafters out there let your imagination go wild, you will be impressed with what can be done with these cabochons. 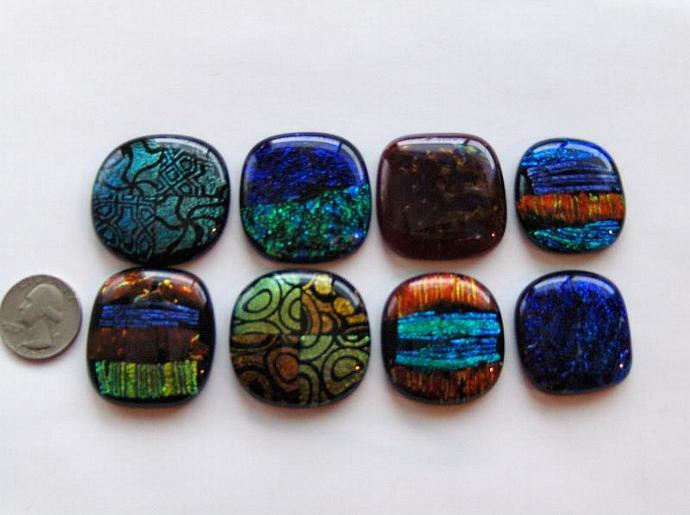 Care of your Fused Glass Cabochons: Simply wash with soap & water, they are very durable! All my items are carefully packaged and usually ship within 24 hours of purchase, weekends and holidays being the exception. Preferred payment method is Paypal, however arrangements can be made to purchase by money order, please email me to discuss. Custom orders are available if you would like a set of similar colors or if you want to mix and match listed pieces. 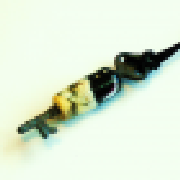 Since each piece is hand cut and fired, exact duplicates cannot be made. Please contact me with your special request. Feel free to email me with any questions or if you would like cabochons made with specific color or size or amount. Thank you for visiting my Zibbet shop. adhere to our Zibbet Shop POLICIES. If you like my work add me to your FAVORITES List! !